Have you ever seen street art like this? 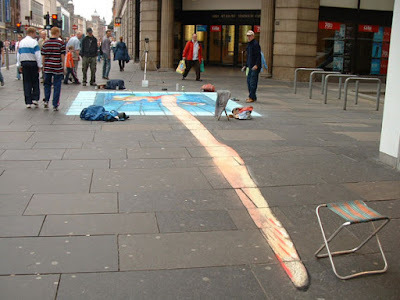 This artwork was created using chalk, a wide-lens camera and a sidewalk. 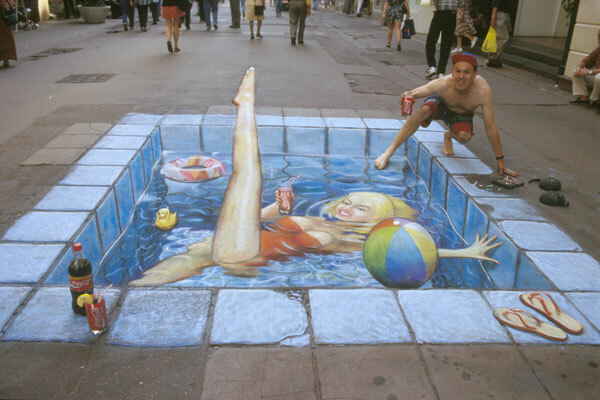 By looking through a wide-lens camera he has set up, the artist is able to create the illusion that the drawing is 3-D on a flat surface. Quite different looking at it this way! The drawing is warped, stretched and actually 3 times the size. The artist “tricks” your eye and mind into perceiving that the picture is something different than what it really appears to be. This is exactly what happens with our eating habits. This phenomenon is called portion distortion. You can bet that restaurants are aware exactly what this is. When you sit down at a nice restaurant to eat your favorite meal, you probably don’t realize how much you’re really eating. Some meals appearing “average” in size can add up to a whole day’s worth of calories. A study published in 2012 found that 96% of the top chain restaurant meals exceed the daily limits for calories, sodium and fat recommended by the USDA. Test your knowledge on portion sizes. Can you imagine sitting in a restaurant and watching someone pull out a scale and begin to measure their food? Besides being inconvenient, it could also be quite messy. A simple way to keep your portions under control that you carry with you all the time…your hand. Use hand symbols for portions. Keep a copy of the above chart with you until you feel comfortable with knowing the serving sizes. Read food labels. Learn to pay attention to the number of servings, calories and fat content per serving. Know market portions and how it compares to recommended serving sizes. The actual serving size for a bagel is two ounces but the market bagel is a whopping six ounces. That’s three times the recommended serving size! Split a meal. Order an appetizer and share the main course with the other person when you go out for a meal. If you’re eating alone, then eat half the meal and take the rest home. Ready for dessert? One dessert and some extra forks, is perfect for three to four people. Use a smaller plate. This is a simple way to fool your eyes and mind. Using your recommended serving sizes, your plate will appear to be full when you’re actually eating less. By watching your portions, this will allow you to control your calories and you can still enjoy your favorite foods. This is just one way I use to live a healthy lifestyle. If you’re interested in learning more about my eating strategy and other suggestions, I’ll be happy to speak with you.